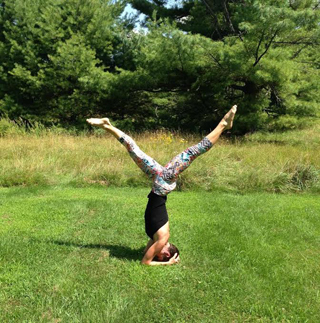 Cara Anselmo is a certified yoga teacher in New York, New York. She completed her 200-hour teacher training at New York Yoga in 2007. Cara is also a practicing Registered Dietitian Nutritionist (RDN) with a Masters degree in Clinical Nutrition. Cara leads thoughtful and challenging vinyasa classes that encourage students to find honesty, openness, and attention to their own work. Her teaching infuses her interest in so many aspects and traditions of yoga, with the power and beauty of the breath underlying all. She teaches precision without rigidity, freedom along with restraint, and compassion always. Cara believes a yoga practice can be beneficial for anyone, regardless of gender, age, religion, health status, or "flexibility." An avid runner who has completed several marathons, she loves to get other runners on the mat to breathe and move in new ways. Yoga has been a grounding and uplifting force in Cara's own life, and for this she is grateful each day. Yoga is not only her asana practice, but the way she lives her life. As both a teacher and student, she is constantly reminded of all that she still hopes to learn. From the bottom of her heart, Cara thanks all of her teachers, past, present, and future. Indeed, she believes all living beings are our teachers.